For my Facebook friends, there's a sequel to recent Facebook status updates, repeated here. 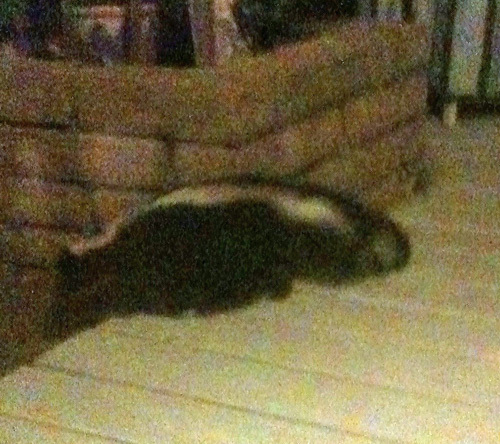 Part the Third, July 30: The skunk again was at the back of the patio. I backed up, made sure the door behind me was closed. "Hey skunk, could you--?" The skunk heads up the back slope. 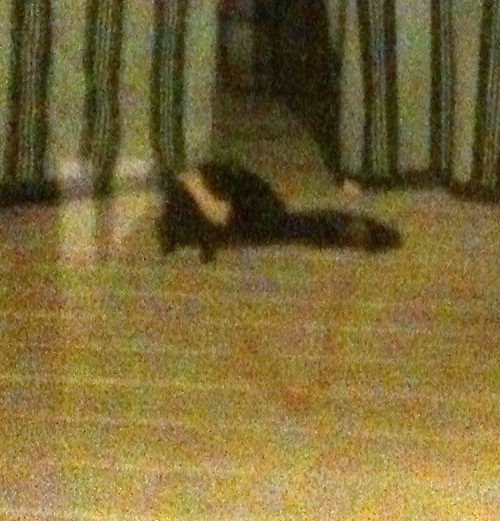 I see the black and white fur appear and disappear. I wait a moment or two longer until I can't see or hear it. "Ok skunk, be quiet now, don't move." I let the dogs out stand between them and where the skunk was, hoping radiating unconcern and we all make it back into the house without incident. Photos are from previous skunk visits (the current skunk is smaller) when my dogs and I would sit behind the back door's protective glass and I would coo and the dogs would growl and occasionally bark. By the way, I don't mind my backyard being a way station for wild animals. Just so long as I respect their space, they can sleep under out patio and eat as many Japanese beetle larvae as they want ( even if this means having to occasionally replant).